Alexa Nordwald accepts the American Agricultural Editors' Association (AAEA) Jim Evans Presidential Scholarship at this summer’s Agricultural Media Summit. Photo courtesy of Alexa Nordwald. University of Missouri College of Agriculture, Food and Natural Resources student Alexa Nordwald, a senior in science and agricultural journalism, accepted the American Agricultural Editors’ Association (AAEA) Jim Evans Presidential Scholarship at this summer’s Agricultural Media Summit. The $3,000 scholarship is the top scholarship provided by AAEA and recognizes academic and leadership excellence and commitment to the agricultural communications field. The scholarship is named after Dr. Jim Evans, who impacted many agricultural communications programs. 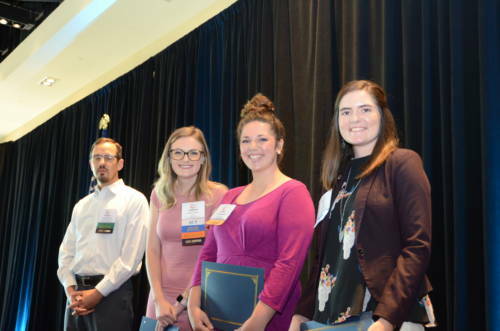 Alexa Nordwald accepts the Agricultural Editors’ Association (AAEA) Jim Evans Presidential Scholarship at this summer’s Agricultural Media Summit. Photo courtesy of Alexa Nordwald. To apply, students must be a member of Agricultural Communicators and Leaders of Tomorrow (ACLT). Students initially submit an application for the scholarship. The pool is then reduced to four finalists who interview at the Agricultural Media Summit. Candidates also submit a portfolio for review. The winner is announced later during the conference. This year’s summit took place from Aug. 4-8 in Scottsdale, Arizona. Nordwald, an East Prairie, Missouri, native, is an active member of Mizzou’s ACLT and is currently the co-president. She said she was drawn to the organization as a freshman at MU to learn more about agricultural communications and where she would fit best within the industry. Nordwald encourages students who are interested in agricultural communications to become involved with ACLT. “There’s on-campus benefits, which are getting to know students that are like you and have similar interests,” Nordwald said. 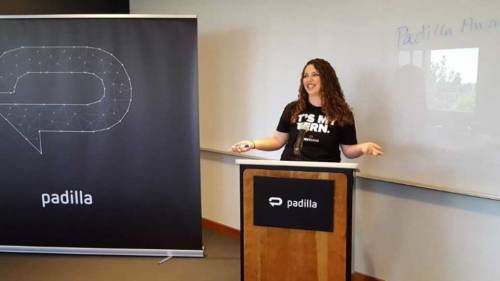 Nordwald at her internship with Padilla. Photo courtesy of Alexa Nordwald. She said there’s also off-campus benefits too, like scholarships, internships and the opportunity to travel for events. Nordwald also received an internship sponsored by AAEA. She spent this past summer in Minneapolis, Minnesota, as a marketing intern with Padilla, a public relations agency. “It’s already played a big role in my professional development and a lot of my networking opportunities,” Nordwald said. Nordwald is the daughter of Nick and Shaelynn Nordwald and will graduate this December. “I just hope that by me getting these opportunities it will help other people on campus see that they can achieve these too if they just apply and put themselves out there,” Nordwald said. The next ACLT meeting is Thursday, Oct. 8. Students interested can contact Alexa Nordwald.